The two most important measurements for choosing your size is on the one hand your buttock circumference (H: hip / buttocks) and on the other hand your torso circumference (T: torso)! If you are in between two sizes, please use the following additional information of the different swimsuit materials to decide which size will fit best. (2Way) Easy Stretch : This material has a high elasticity and stretches well. You have approx. 2-3 cm space upwards. If you are in between two sizes, choose the larger one for more comfort, or for the smaller oneif you like it tight. SSW - Super Shiny Wet : This material has a good elasticity and stretches well. You have approx. 1-2 cm space upwards. If you are in between two sizes, choose the larger one for more comfort, or for the smaller one if you like it tight. ITALIAN SHEER : This material has a very high elasticity and can be stretched very well. Because these suits are cut more tightly according to the elasticity of the material, you have ONLY about 2-4 cm of space upwards. If you are in between two sizes, choose the larger one for more comfort, or for the smaller one if you like it tight. SECONDSKIN : This material has a very high elasticity and can be stretched very well. Because these suits are cut more tightly according to the elasticity of the material, you have ONLY about 2-4 cm of space upwards. If you are in between two sizes, choose the larger one for more comfort, or for the smaller one if you like it tight. 200s series Japan ENAMEL (rubberized) : This material has a reasonable amount of elasticity, but overstretching will permanently damage the surface: strict focus on the size chart. If you are in between two sizes, we recommend the larger one. You have about 2-3 cm space downwards (for an optimal fit). 700s series Japan ENAMEL (rubberized) : This material has a reasonable amount of elasticity, but overstretching will permanently damage the surface: strict focus on the size chart. If you are in between two sizes, we recommend the larger one. You have about 2-3 cm space downwards (for an optimal fit). 900s series Japan ENAMEL (rubberized) : This material has a good stretch level. However, overstretching will permanently damage the surface. If you are in between two sizes, choose the larger one for more comfort, or for the smaller one if you like it tight. You have approx. 2 cm space downwards (for an optimal fit) but also 1 cm space upwards. We have made the experience from numerous photo shootings which was very similar to our customer´s feedback of the last years results that in most cases there is one size difference between the textile and the rubberized suits. If you have a perfect fit in the Realise size L of a SSW or Secondskin suit - choose a size 2L for the rubberized suits. Please also note that Realise swimsuits only achieve the optimum visual effect (as seen in our photos) when worn very tightly (possibly out of your comfort ). XS : available for styles "Barbuda" and "Paola"
The swimsuit styles "ATLANTIC", "BARBUDA", "BLUEHOLE", "DIVA", "DORADO", "PAOLA", "SONORA", "VICTORIA" as well as the two-piece "LAYOU" have the same basic (female) cut in all sizes. All of these suits are originally designed for women's bodies, but these can also be worn by men - depends on measurements. 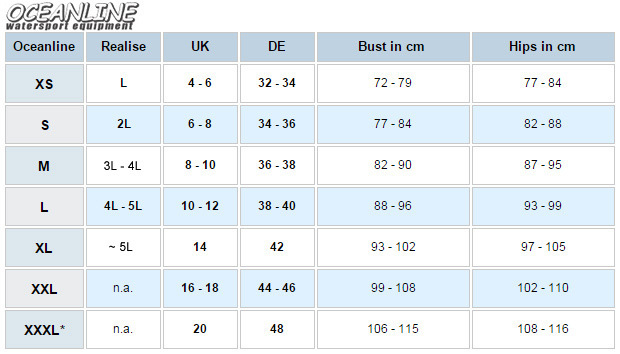 The wetsuit styles, "SPRINT SKIN short" and "SPRINT SKIN long" are unisex models and therefore have slightly more space in the chest area (over bust) - it is about 3% more than specified in the sizechart above. Consider this when buying your suit.